A host of representatives from throughout the George Washington University (GW) health care community joined GW Cancer Center leadership on Oct. 17 to cut the ribbon on a new multi-disciplinary cancer clinical space in the ground floor of the GW Medical Faculty Associates (GW MFA) Ambulatory Care Center at 2150 Pennsylvania Ave., NW. 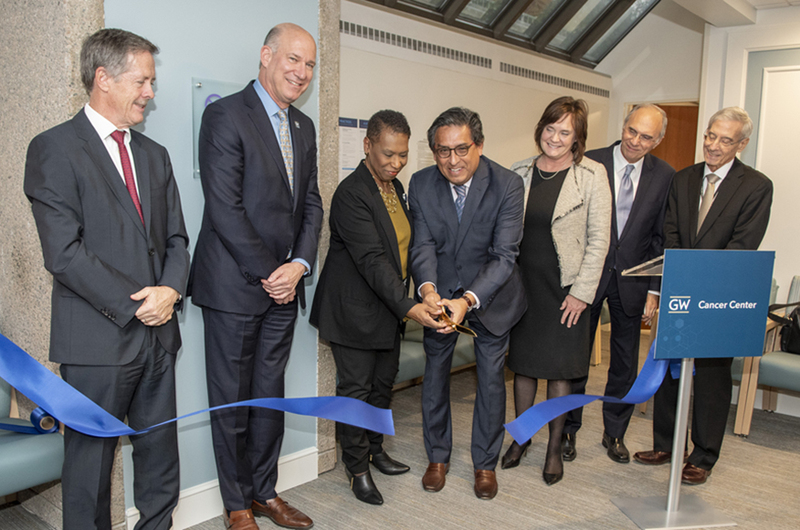 The newly redeveloped clinic brings 4,600 square feet of additional space for cancer patients, dedicated primarily for solid tumor cancer treatment. Together with existing cancer resources on the first floor of the GW MFA including infusion space and the malignant hematology clinic for leukemia, lymphoma, and myeloma patients, the new clinical facility adds 16 exam rooms, one procedural room, and a pair of consultation rooms that also will be used for clinical research discussions. In 2015, the GW School of Medicine and Health Sciences (SMHS), GW Hospital, and the GW Medical Faculty Associates decided to make significant investments to establish the GW Cancer Center by bringing together all cancer-related activities under one umbrella and building a premier cancer center to serve the Washington, D.C., metropolitan region. “This dedicated floor for cancer clinical care and research will bring together hematologists, oncologists, surgeons, radiation oncologists, pharmacists, social workers, [and] clinical investigators to provide in one place compassionate and multidisciplinary care,” said Eduardo M. Sotomayor, MD, director of the GW Cancer Center and professor of medicine at SMHS. The space will serve as a one-stop facility for patients. Appointments can be scheduled for the same day, meaning patients won’t have to trek from one clinic to the next for their follow ups.